MiniMe is MIA. 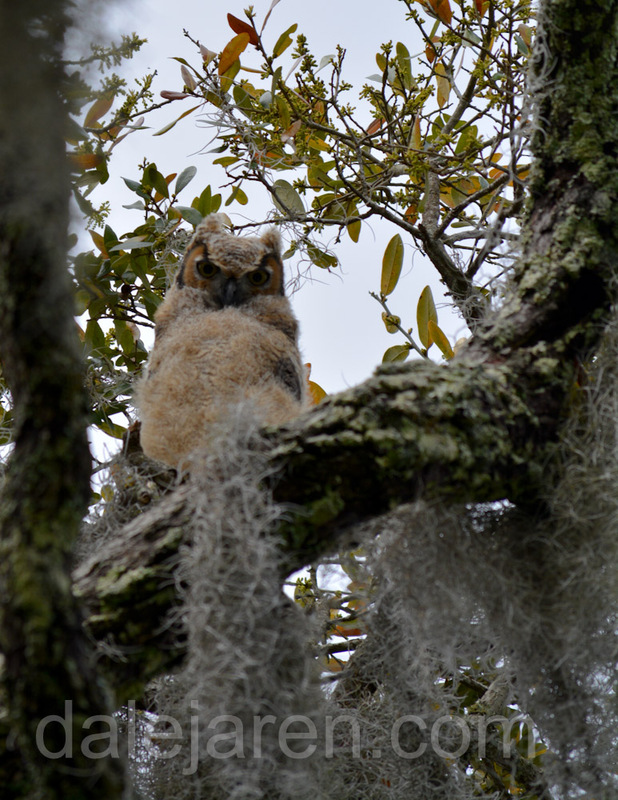 After its near fatal traumatic swimming experience crossing the creek on Wednesday, Marsh 26th, Mm spent almost all night in the nest tree. Scott found it early the next morning in our neighbor’s yard on the opposite side of our house from the neighbors near The ISLAND. As we look out to the marsh from our house, MiniMe is to the far right. MiniMe looks good. Parent was observed feeding it on the ground. We watch from a distance and our neighbors are keeping tabs too. MiniMe stays on the ground in the general area all day Thursday. At dusk we hear three owl voices. One adult. Two owlets. The owlets are being fed. One in a tree and one on the ground. Then our neighbors, watching from inside their house, see MiniMe trying to climb up a tree. Great news! It appears as if a parent is trying to encourage it to climb up. Scott has tied me to the porch so I don’t go out to investigate, interrupt or scare off the parent. We watch and listen but it is getting very dark and then we can only listen. All pretty normal. We go to bed hoping for the best. Then I get a text from our neighbors. MiniMe is getting too close to their pond! You have got to be kidding me. I text back that I am coming over with flashlight. So it is about 11 PM on Thursday night and my two neighbors and I are out there with flashlights checking on MiniMe. There it is, just sitting next to the pond looking innocent. Obviously the climbing lesson was not successful. What is it with this owl? Now it wants to be a duck? 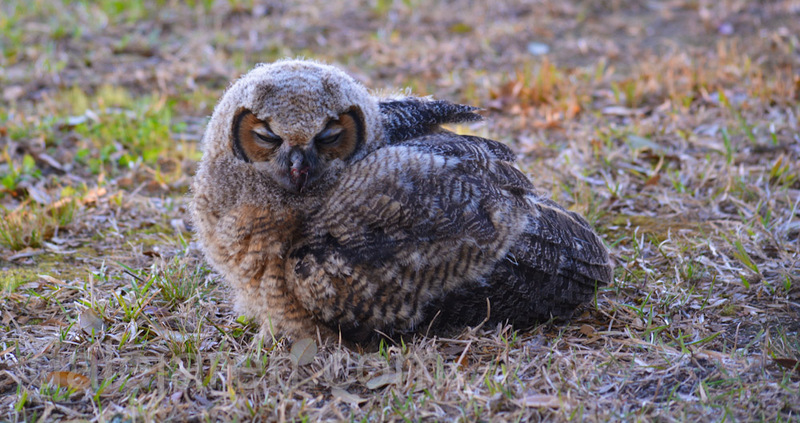 This is what this adorable, fuzzy, vulnerable little owlet looks like when it does not want to comply. (Photo taken a few days earlier). Seriously, do NOT tell me what to do! After weighing the risks, benefits and play out the ‘What ifs” we decide the best thing to do is to do nothing. Friday morning, MiniMe is missing in action. Everyone is looking for it and listening. Nothing. I find Big Sib high up in a tree. Between looking for MiniMe and observing where Big Sib is, I wash all the muddy towels, blankets and clothes. I also, finally, vacuum. Scott and I go out to an early dinner so we can be home by dusk to watch and listen. 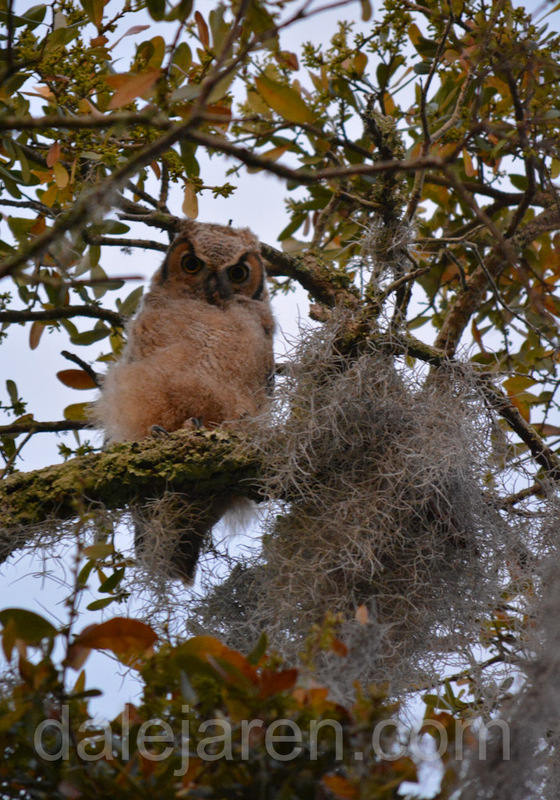 The owlets do a lot of squawking at feeding time. The tide is full, prime hunting time. We hear squawking. One voice? Or two? At full high tide with moisture in the air and rain showers, your ears can play tricks on you. We see flapping silhouetted in the trees. But only one owlet visual. Big Sib does not usually flap around. Could that be MiniMe? Finally, in a tree, learning how to maneuver to get into a feeding position without sky diving? Saturday morning, I am up at dawn. 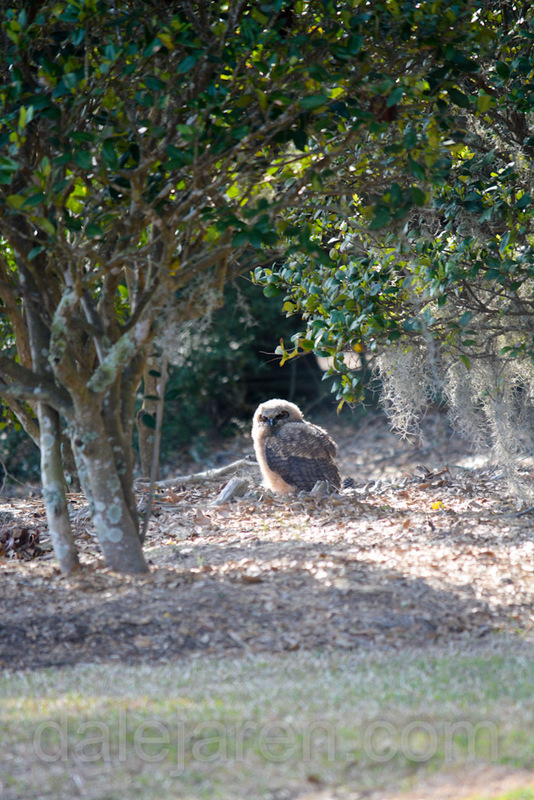 Do I hear two owlets squawking or only one? They are ventriloquists. If there are two, they are close together. I cannot see through the trees and Spanish moss in the early light. There is insistent squawking. I want to believe it is MiniMe. The much more vocal of the two. But I cannot verify. 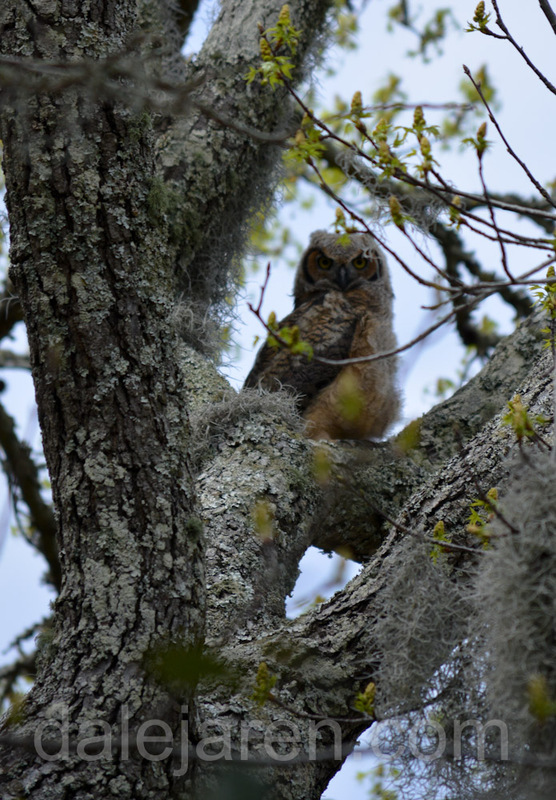 I have taken photos of one owlet high up in the tree tops at various times in the past several days. I enlarge and compare. The owlets are almost full grown now but are still fluffy with down on their chests and with the ‘horned’ feathers just starting to show. From the back and sides they look more like adults. They are clumsy when flying and hopping from tree to tree. One owlet or two? 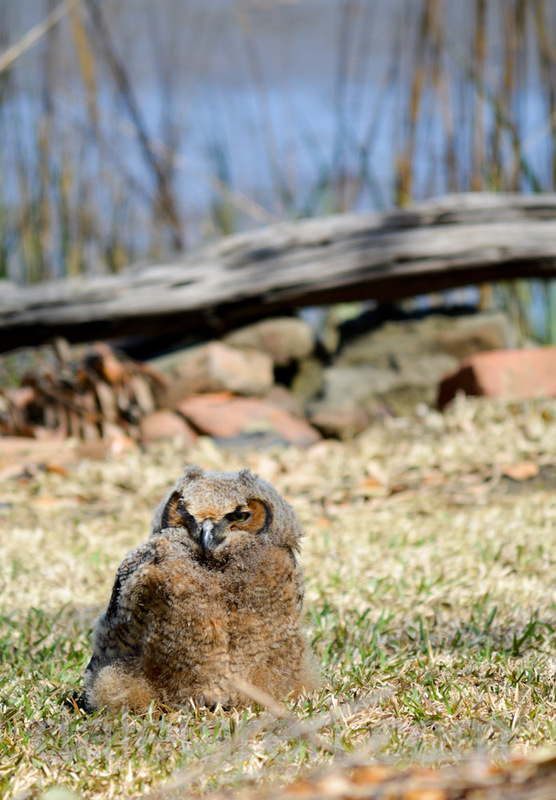 Until we can see two owlets at the same time, we consider MiniMe to be MIA. We have hope. Dang, that has got to be frustrating. Not to know. I’ll look forward to the update. I’ll be hoping and praying she (?) turns up somewhere. Sure has personality and attitude enough to survive. In the meantime you have become one very competent photographer! 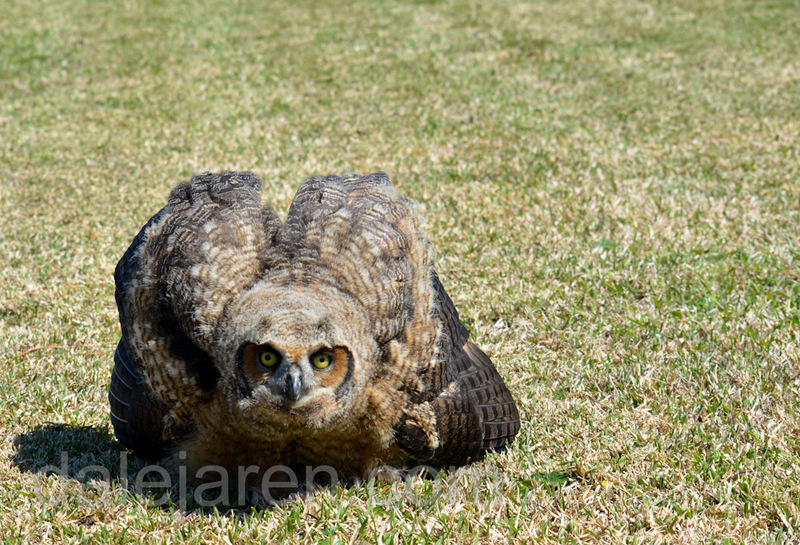 I wonder if MM could have some sort of vestibular (or whatever they call it in owls) issue?